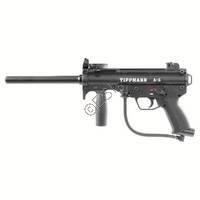 The Tippmann A-5 takes the Model 98 internals to a whole new level. The A5 is all about rate of fire. The patented Enhanced Cyclone Feed System uses a feed sprocket system connected to the air system to give you a blazing 15+ balls per second rate of fire! The A5 also uses a push pin setup that allows you to field strip and reassemble the A5 in 60 seconds… without tools! 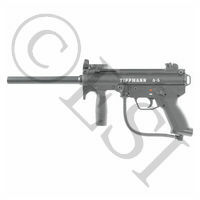 Combining technology with Tippmann's trusted durability and reliability give you peace of mind so you can focus on eliminating your opponent. The all aluminum die cast receiver with a black powder coated surface gives you one of the toughest paintball guns available on the market today. Want to add on performance modifications or update the look? Don't worry, there are hundreds of accessories available to deck out your Tippmann A5 to the max. Based on the tried and true Model 98 internals. All aluminum die cast receiver with powder coated black for durability. Enhanced cyclone feed system for blazing 15+ ball per second rate of fire with large mouth 200 round hopper. Built in vertical bottle system to make the A-5 even more compact. Removable and adjustable vertical foregrip. Front cocking which allows to have a fully enclosed body to keep out debris. Fully upgradable with hundreds of accessories for looks and performance such as an E-Grip. Fully compatible with CO2, compressed air, or nitrogen.